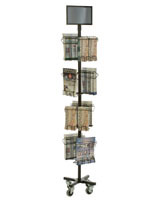 These rotating brochure displays are ideal for travel bureaus and banking locations that have limited space. 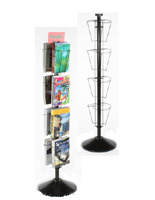 The 4x9 pamphlet dispensers are made out of a particularly tough black wire for increased longevity. 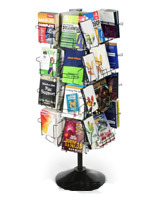 The rotating brochure displays, sometimes referred to as freestanding literature stands, are practical tools for bustling commercial atmospheres, like museums, gift shops, visitor centers, and lobbies or waiting rooms. 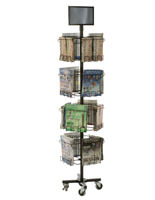 The 4" x 9" brochure displays feature (32) individual pamphlet compartments. Each of the (4) sides has (8) pockets that are sized for 4x9 leaflets. 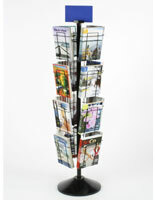 The literature stands, brochure displays allow users showcase large amounts of literature without taking up valuable space on the floor. 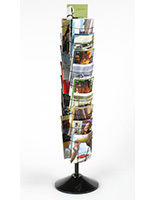 The rotatable stands revolve 360 degrees, which maximizes exposure to all the pamphlets. 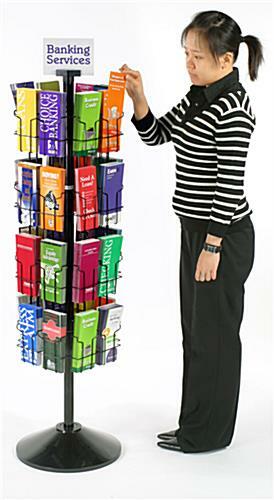 Each of the spinner literature displays is equipped with a handy sign clip for labeling or exhibiting customized signage. 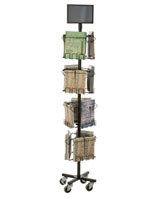 The racks are sent out unassembled to keep shipment costs lower but are easily put together in just a few minutes. 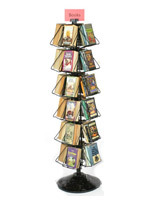 These high visibility spinning literature displays are the perfect addition to foyers, entryways, and other high traffic areas. 16.0" x 57.0" x 17.5"
4.1" x 1.3" x 10.0"